On a map, Grimsay is difficult to distinguish in the confused mass of shifting tidal sands, sea, lochs, islands and islets that occupies the area between North Uist and Benbecula. This area is generally known as North Ford. 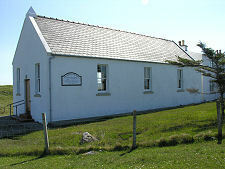 Until 1960 it was one of the most difficult obstructions to passage along the length of the Western Isles. 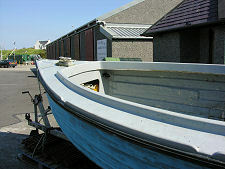 A ferry linked Carinish on North Uist and Gramisdale on Benbecula, but could only operate at high tide. And there was also a ford, the North Ford, usually only crossed with the help of expert guides. The route of the ford was marked with cairns, but it shifted unpredictably with the sands, it could only be passed for an hour either side of low tide, and it was four miles long. For significant parts of each day the North Ford was too wet to ford but not wet enough to cross by ferry. This all changed on 7 September 1960 when the late Queen Mother opened the North Ford Causeway. This five mile arc of single track road links North Uist and Benbecula via the western tip of Grimsay. 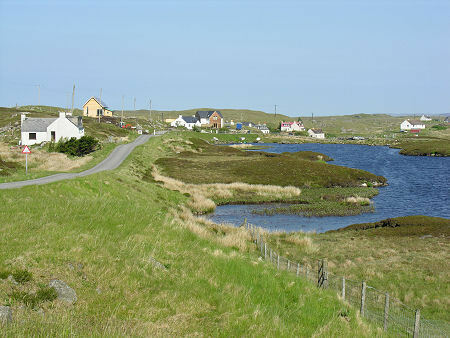 It made the newspapers later that week when motorists from Lochmaddy reached Lochboisdale within a day using the new causeway: something unheard of until then. Grimsay is about four miles long by two wide, and is aligned from north west to south east. 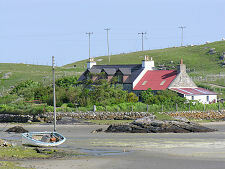 It is encircled by a single track road that links most of the island's small crofting and fishing settlements together. 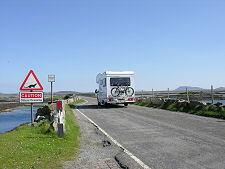 Turning at the more northerly of the two junctions with the A865 on Grimsay takes you along the north coast of the island. 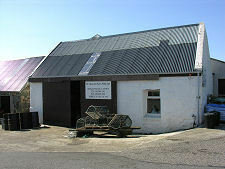 A few hundred yards from the junction you come to Grimsay's craft shop on your right. Further on is the settlement of Baymore, a favourite haunt of artists. 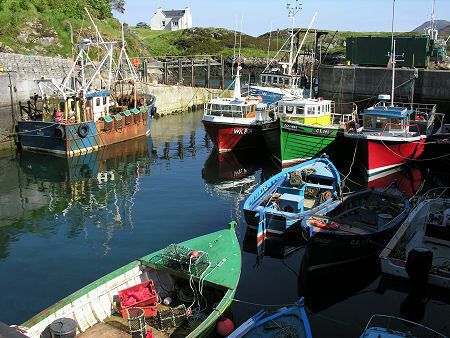 At Grimsay's south east tip is the village of Kallin, the focus for the island's important and growing fishing fleet. 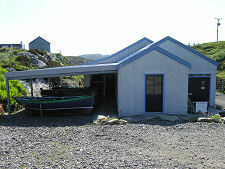 The harbour here was built in 1985. 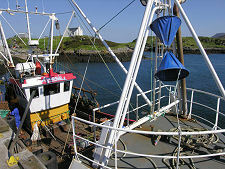 The boats from Kallin fish for shellfish using creels, and flatfish using long lines. 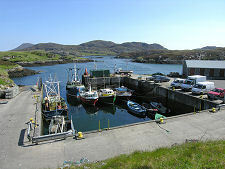 The area is also an important centre for fish farming. A sign of the importance of Kallin's fisheries are the vehicles you see here from southern Europe picking up produce for markets and restaurants in Spain or Italy. It is all too easy to overlook Grimsay as you follow the North Ford Causeway across a few hundred yards of the tip of the island. But it really is worth spending the time to see a little more of this active and attractive little island, and Kallin is particularly worthy of exploration.